What ever happened to all the stuff you were doing? My old laptop is broken so I lost all blockland addons and blend files so I'm on my new laptop so i have to start over again. I noticed, the new cars don't seem to have glass parts. Any particular reason for that? Trying to simplify the workflow? "Trying to simplify the workflow" is a really nice way to put it. In truth, I couldn't determine how to add them without ruining the shadows now that I'm using the new DTS exporter, then I remembered how bad they look in fog and said "forget it"
I like the Emperor '79, I have wanted a car like it in Blockland for a long time now. I also like that the Emperor and Hero have reverse lights and turn signals, it adds a nice touch of realism and is useful for people who may use them in RP's. Since everyone else is making requests, I suggest a minivan. 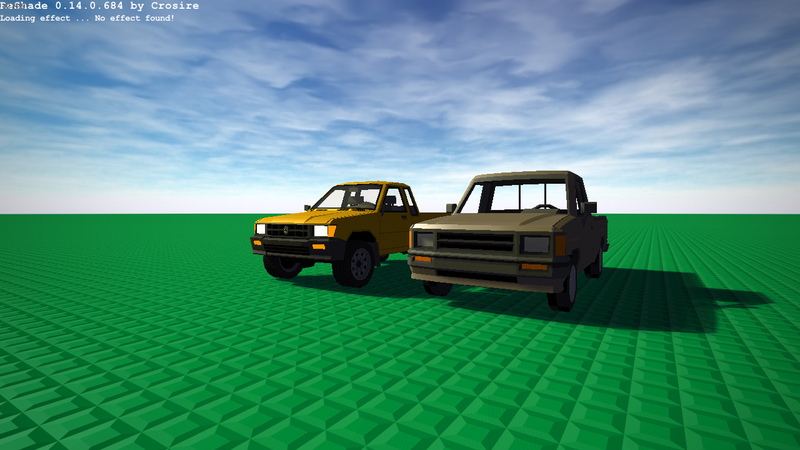 You seem to make types of vehicles that aren't very common in Blockland, and we don't really have any minivans so I think it would be useful to have one. Nice truck, looks lovely and accurate. Looks pretty neat alongside the Coyote truck Turtorn made for me awhile back. So we can hunt monsters and demons? I think you make some of the best cars in Blockland. Keep it up! The style is great and the features are super cool. the Coyote truck Turtorn made for me awhile back. Part of it comes down to interface preference. I can understand CVS as something where you get in, check out the options, click around, and get it how you like. I like to be able to spawn a car and immediately type out what I want to change, without having to navigate through anything. I like including factory colors. The biggest thing is that I like some parts of garage, but not all of it. If I want to make it more user-friendly to change visual accessories, I have to accept that they'll end up sporting clashing neon colors. With /veh, if I don't want something, I simply don't add it. And if I want anything at all, I can do it. It's less like a menu, and more like a table of contents for a bizarre owner's manual, and I can understand how that's less appealing for you, but the format allows me to make it do anything. It can trigger specific animations, communicate directly with the vehicle, provide information and controls for the player, and completely change something without any dependencies because it's all just triggering a script I make specially for each vehicle that has it. Granted, I haven't yet used it in quite the complex way I've suggested it could be used, but I have already added factory colors, which I greatly enjoy, which is something CVS cannot do. When I make a sportier vehicle -- one which would actually look suitable with bright stripes and lots of options for bumpers or spoilers -- I may reconsider. However, I do not intend to make it an option on every vehicle. Teneski have you thought about Hazard lights? Good for CRPG's and Driving Simulators. is there a way to disable the /veh commands in use of ya know.. survival servers n' such? It may be possible to completely neutralize it by copying Support_VehicleEditHelper.cs into a new script add-on, changing the version to a high number, and making it so that both functions do nothing. EDIT: Or maybe I could just do that.